Buy the Farm . . . Share: Clap for Babies! We have a pretty good system down with the Wombats. We feed them their dinner, follow up with snacks, read them a story, sing them a song, and put them to bed. Sometimes we follow up with a bottle if necessary. It all seems to work pretty well most nights. Last night was one of those nights where everything went out the window. I was by myself. Often when I'm by myself my sweet little sons take pity on me and give me an easy night. Last night they decided they were going to lose their minds. I got them home from day care and noticed Elliott happily clapping in his car seat. I'd never seen him clap before so, after a minute or so, I took this video. At the end of the video you can hear Martin working himself up and you can see Elliott quickly fade from happy clapper to distressed baby. The next 90 minutes was a blur of screaming, tears, and a frantic race to put them to bed and hope they could fall asleep. Ten minutes before Jen arrived home they were both sound asleep. Jen was disappointed she missed seeing the guys and wanted to go peek at them while they slept. I warned her against this with the promise of a quick and furious violence. 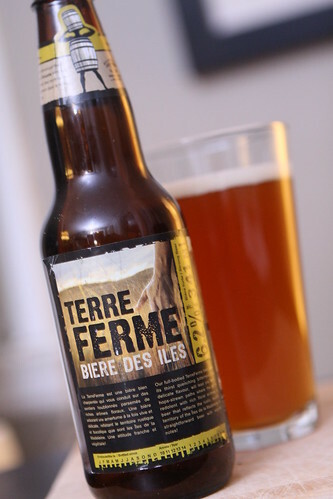 While working on a very quick dinner I had this Terre Ferme from À l’abri de la Tempête, another purchase from our recent Quebec trip. It was a nice IPA bordering on Pale Ale. I'm pretty sure that after that baby wrestling match a can of Milwaukee's Best would have been every bit as enjoyable. Or maybe just pure grain alcohol. 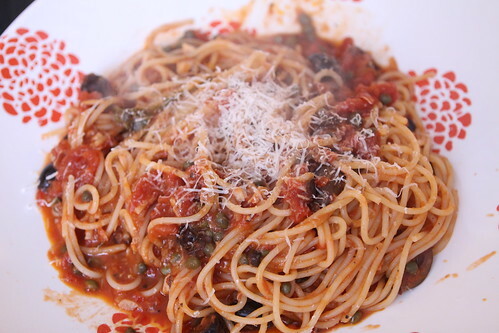 During the hurricane, when we were staying at a hotel in the city, we ordered room service and I ordered one of my favorite dishes: pasta puttanesca. Unfortunately what I got was one of the worst plates of puttanesca I've ever had. It's been over five months so I decided I would make a redemption puttanesca. I cooked some anchovies in a pan, added the leftover sauce from the roast cod the other night, then tossed in some cooked spaghetti. The result ended up being approximately 1532 times better than what we paid probably $30 for at our hotel. 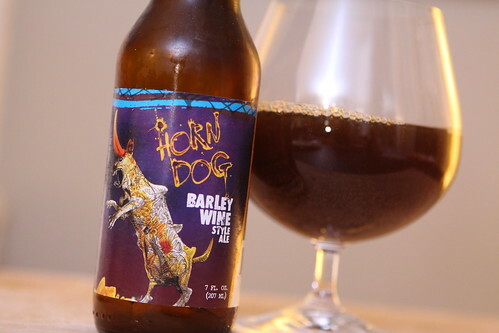 After dinner I was still enjoying the peace brought on by two sleeping babies and decided to open one of these tiny Horn Dogs from Flying Dog Brewery. I bought them in 2011 and have been hanging onto them ever since. It was a decent American barleywine and a nice cap to a meal. It had far less carbonation than I would have expected. At 10.2% ABV I was very happy to only have a seven ounce bottle. That was the perfect amount to cap off the evening. Elliott ended up waking up around 1:00 AM and I put him in bed with us, ignoring Jen's 5:00 AM rule. Sometimes it's just easier that way to get some sleep. I'll take sleep any way I can get it. Even with a baby's feet in my ribs and his tiny hands smacking me in the side of the head.